Six weeks in creative heaven! I fell in love with Bali on my first visit there three years ago. So when I had the chance to make a second visit, I didn’t need much persuading; it’s an artist’s heaven. For those of you who have never visited Bali, I am based in an area called Ubud and it’s April 2019. It is known as a centre for traditional arts, crafts and dance amongst the many terraced rice paddies. But if you get out of the bustling town, you will be surrounded by rainforest , dotted with Hindu temples and beautiful gardens. The deliciously fresh, local food is ridiculously cheap and enchanting homestay accommodation is fantastic. The Balinese are friendly and very welcoming – who wouldn’t want to return as I have! This time, rather than a short holiday I decided to come for almost 6 weeks and while here I have been doing a lot of sight-seeing with friends who live here but my main aim was to do creative work. Followers on Facebook and Instagram will have seen Herbert the Hare on my posts. He’s the needle felted hare I made to accompany me on my travels. 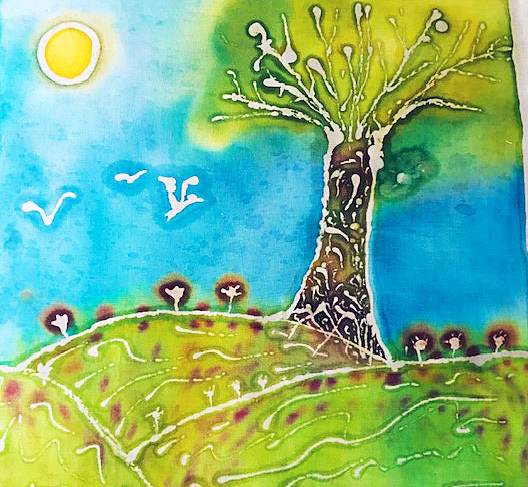 My Feltworld – Creative Art Courses include several different courses based on wet felting and needle felting, and also Batik, which is a beautiful way to create designs on pieces of cloth. 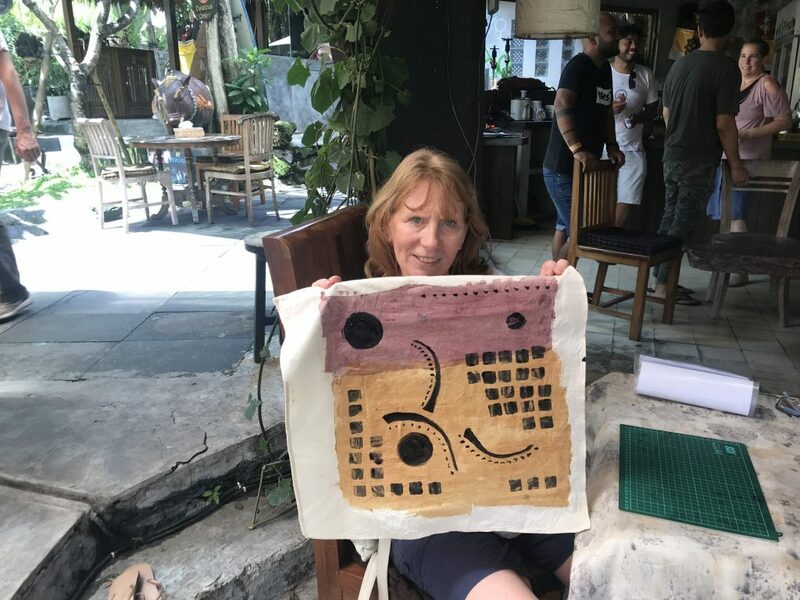 So this time in Bali I’m sharing my knowledge of feltmaking, which isn’t so common here, while at the same time taking masterclasses in Batik. 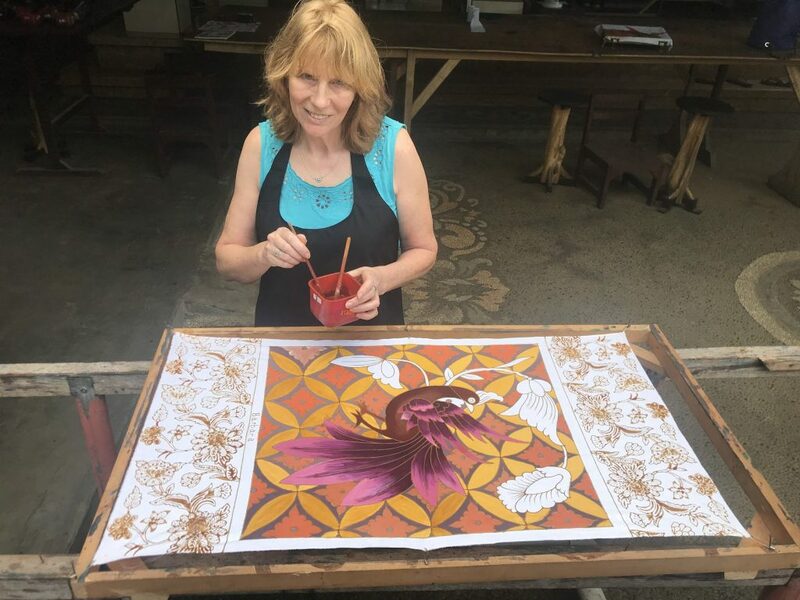 Indonesia is one of the centres of Batik excellence, so the chance to study with some of the great Batik experts is not to be missed. I’m also exploring organic eco printing, a technique I had touched on previously and was excited to purchase natural dyes and bring some 100% cotton fabric home with me. As an artist it is important to me to try new techniques and keep on learning; I am currently experimenting with incorporating felt with batik and discovering how the two natural fibres react when combined. Being surrounded by artists in a creative community is so inspiring. 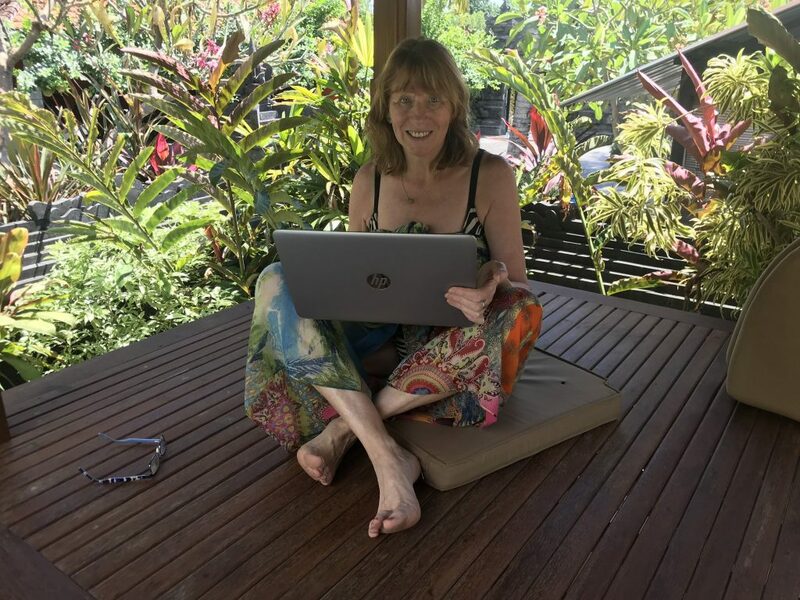 I have spent 4 hours a day working on marketing, social media and writing articles as running a creative business doesn’t stop when you are away. 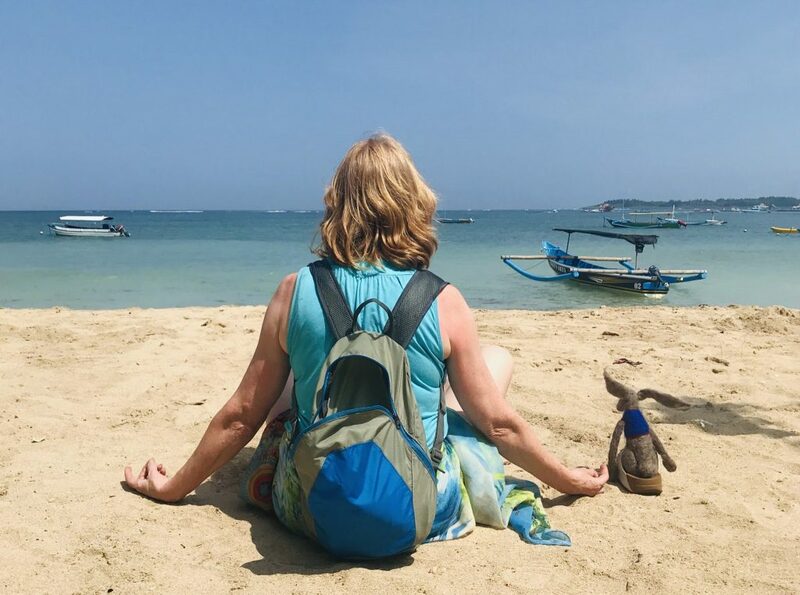 My time in Bali, has been transformative, and a fantastic experience. Frankly – for me, it is creative heaven and just what I needed to keep my creative mojo alive! I will definitely visit Bali again. Still working, even if the “office” location has changed! 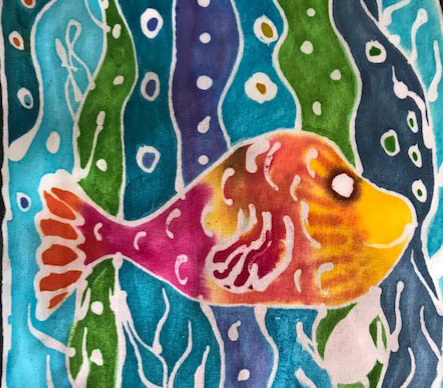 Batik is not so much an art form as a journey in art. With it you can create beautiful, functional pictures. 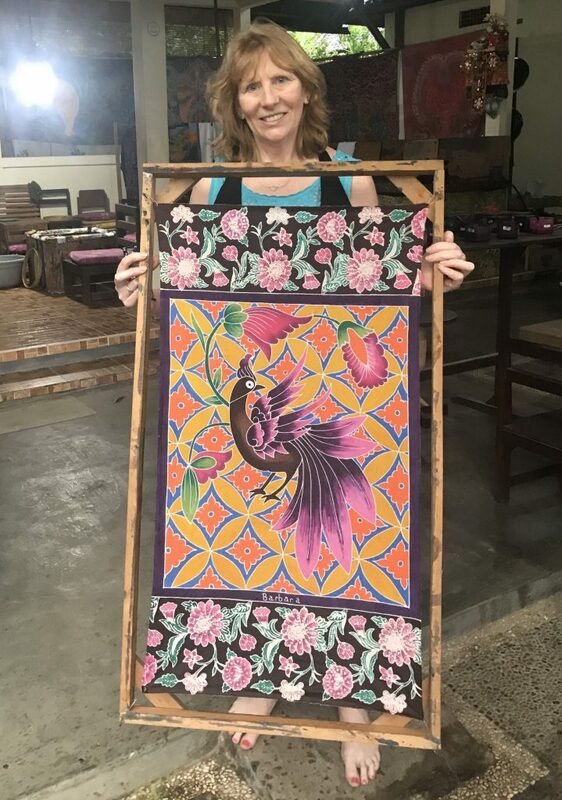 The colourful Batik piece will look lovely when framed. Alternatively you can turn it into soft furnishing or even an item of clothing. Using 100% unbleached cotton, silk or other natural fibres you define your design with hot wax. I like to mix my own cold water dyes with soda ash to fix the colour. I mix my own colour pallet from 5 basic colours. I then carefully paint the cotton with my dyes as a water colourist would paint his paper. The cloth used has to be one that will absorb the dye and become colourfast when finished. Cotton cloth holds a dye easily and is therefore a popular choice. As you can imagine, applying dye to a cotton cloth will cause the colours to bleed. This is sometimes desirable but you still need a means to control the spread of colour. 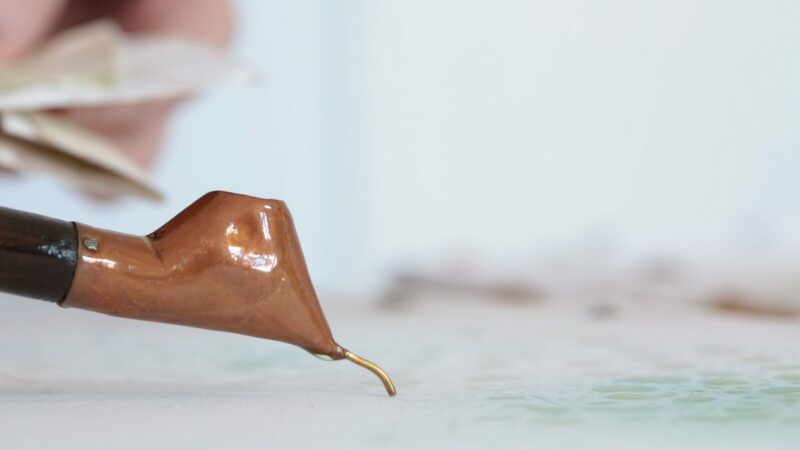 A tjanting tool with a spout to release the wax enables you to draw lines or dots, and different sizes allow you to design with varying degrees of line thickness. You can also apply wax using sponges, brushes or printing blocks. The hot wax penetrates into the weave to enable the underlying cloth to remain white, stopping any dye spreading to that part of the cloth. We remove the wax once the dyed cloth is dry. But don’t expect to create fine, intricate designs – we are talking hot wax which itself can be a little unpredictable at times. In fact it is the organic design due to the flow of wax and dye that gives Batik it’s charm and encourages a loose style of art. A. The wax is hot to make it flow but no hotter than wax in a lit candle. A. Older clothes and an apron are advisable as we paint with fabric dye. A. 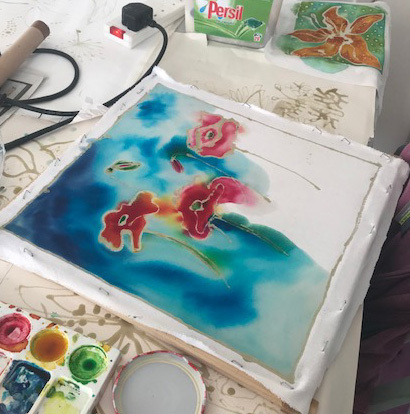 Visit the Batik Painting course page (https://www.feltworld.co.uk/batik-painting), select the date you want to attend, and pay securely through PayPal or Bank Transfer via the link. Hello, as I write this the …’Tis the season to be jolly’ is half-way through, the turkey’s been eaten, the chocolate pile is dwindling, and the house decorations are still twinkling – with thoughts of when to take them down in the back of my mind. Elsewhere, shopping is back in full swing with the sales signs everywhere to lure us in – something I have avoided so far! On the subject of stress and shopping, my advice is …’don’t spend on things that you don’t need’ :-). Possessions are great but making memories is also important. I find that learning new creative skills lasts longer and gives tremendous satisfaction… and hopefully with a thirst to learn more. I love going on courses myself and have my eye on quite a few scrummy courses already. 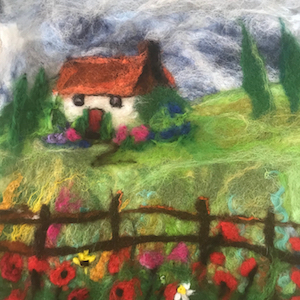 I’m looking forward to running my Feltworld courses in the new year and gift vouchers are always available should you need ideas for late presents. My courses include batik painting, wet felting and needle felting, and also mosaics. Do you have a birthday coming up? need ideas for a hen party? a children’s party, or even a community get together? Well just take a look at the course details and video clips on my website and for some inspiration. Hello and welcome to my creative world. 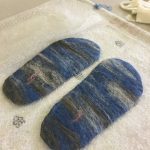 In previous posts, I’ve written about wet felting techniques. 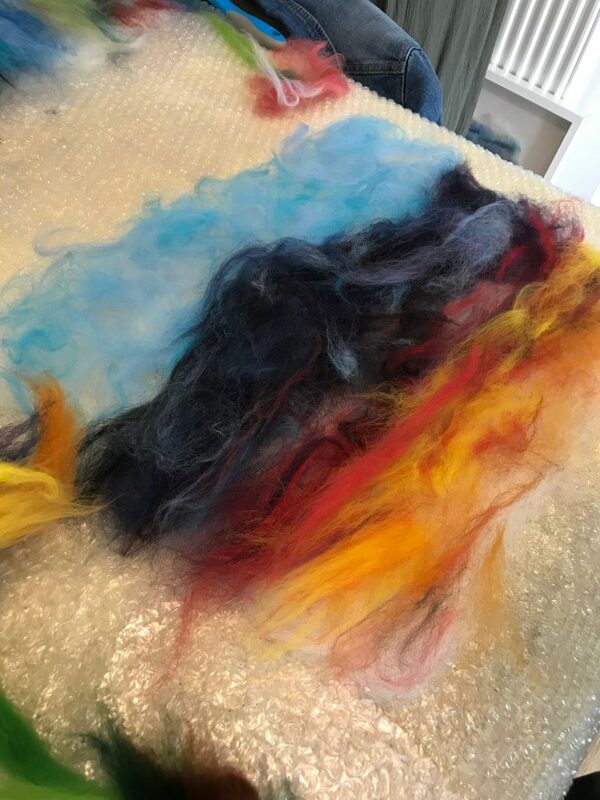 Wet felting is where you use soap and water to felt 100% natural lambs wool fibres together to form a durable material, the tiny hooks that are on the individual fibres link together due to the action of rubbing the wet fibres. This month I want to tell you about needle felting. 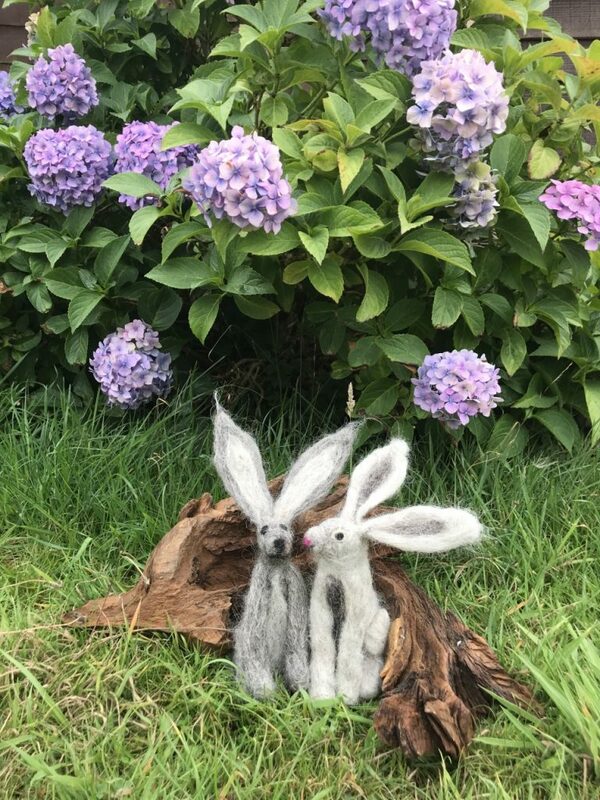 Needle felting, is classed as dry felting and doesn’t require water but a sharp needle with barbs /niks in the needle, these little niks with grab the fibres and bind them together to make felt like magic. These needles come in a variety of sizes. There’s a thicker blunt end that you hold and a much finer end that you use to stab into the loose woollen fibres. And make sure it is the fibres you are stab, not your fingers, ‘cos they are sharp! But this technique is fun and it never ceases to amaze me what you an make from just stabbing away at the fibres. As with wet felting, needle felting will allow you to make flat or 3D items. For flat pieces, the wool is placed on a piece of foam or polystyrene that will let the needle penetrate the wool easily . Further strands of wool are added and joined to this base later using the same technique. Pretty soon you will have either a 3 dimensional animal or flat picture that can be framed and hung on a wall. 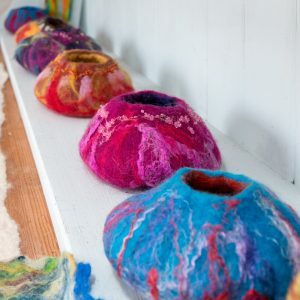 To get started with 3D pieces, you first make a ball of felting wool and gently stab the needle into it until it becomes a compact mass that holds together on its own. Once you have this basic ball, you can add to it and begin to give it shape. In the pictures, you’ll see how I’ve formed the felted wool into the shape of a rabbit. Little animals lend themselves to this kind of needle felt sculpture, and you can make small birds or other furry animals. Once you are proficient at needle felting, you can even include wire formers inside the arms of an animal to allow limited movement. 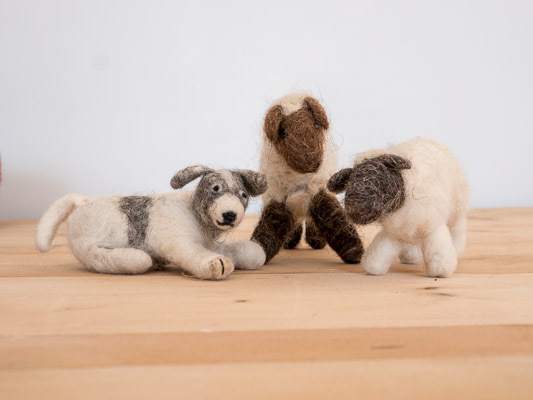 If you would like to learn how to do needle felting, I offer half and one-day courses. All the materials and refreshments are supplied. The full-day session also includes a light lunch. 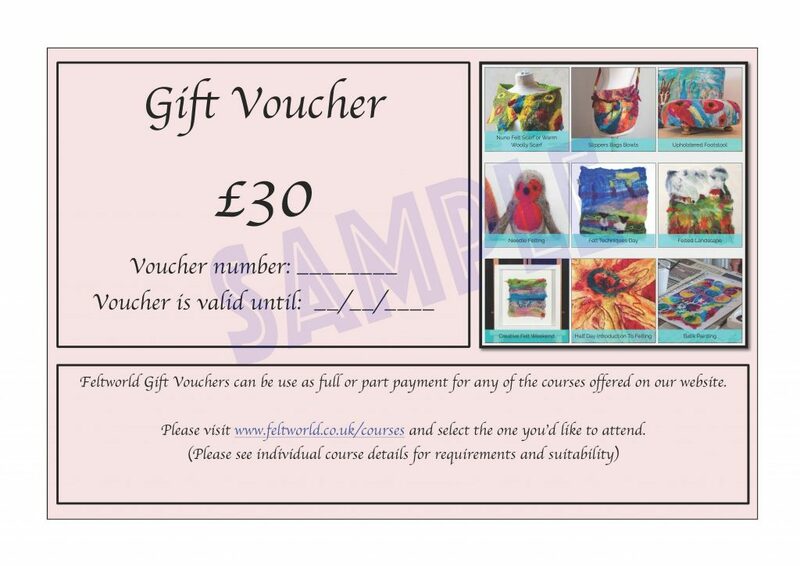 Why not come along and see how it’s done – or perhaps give a Feltworld gift voucher to someone you love. Feltworld – Creative Art Courses offer a variety of fun creative courses covering wet-felting, needle felting, batik, and textile printing techniques. Based in Penkridge we are easily accessible from the M6 and the Rail network. Have a very Merry Christmas however you spend it. The clocks have gone back, any hope of an Indian summer has faded, and winter woollies are making their annual appearance. But while the weather may be drab, there’s no reason to dress in a boring way. In fact, you can dress warmly and still turn heads with a unique scarf that you’ve made yourself at a Feltworld Creative Art Course. 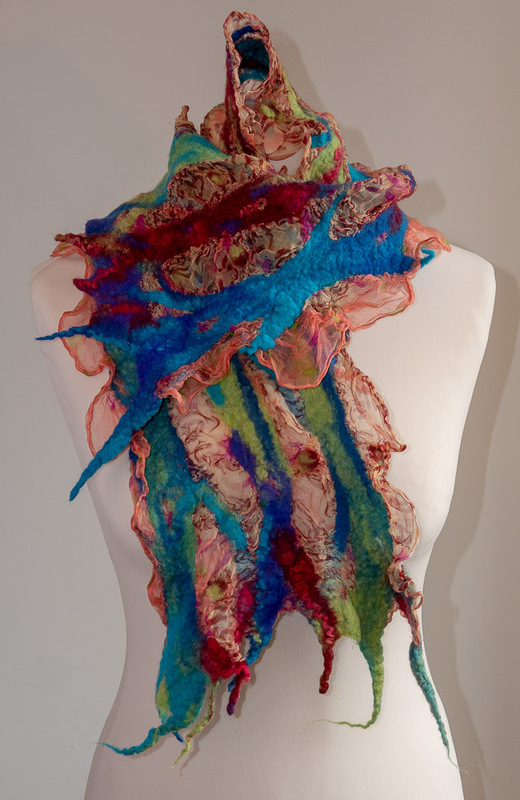 Feltworld offers scarf making courses several times each year, with a number of them over the winter period. 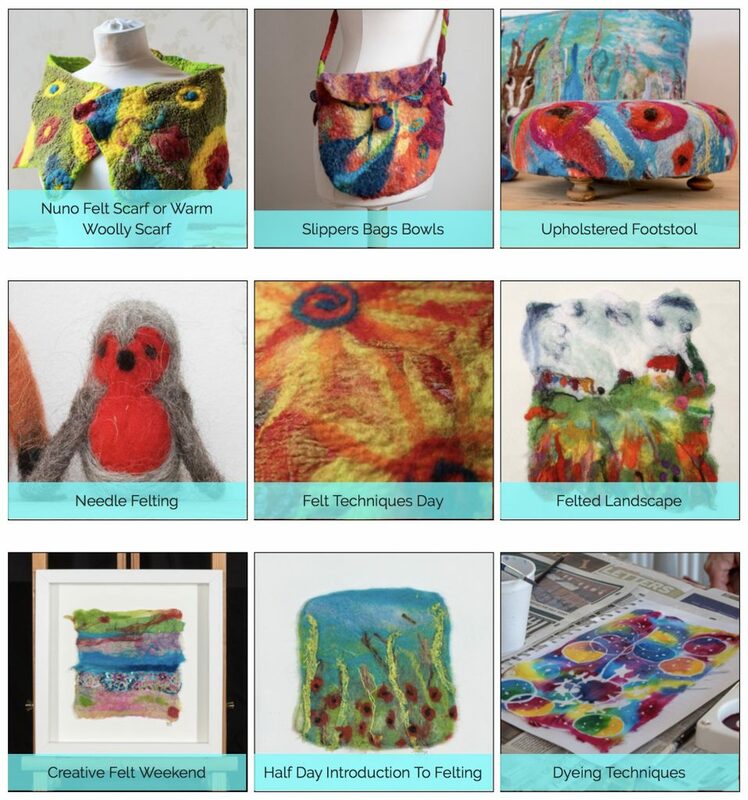 Why not come along and see for yourself the beautiful designs that are possible with felted wool. You have two options. There’s the traditional warm woolly scarf that’s ideal for keeping out the cold on long winter walks. 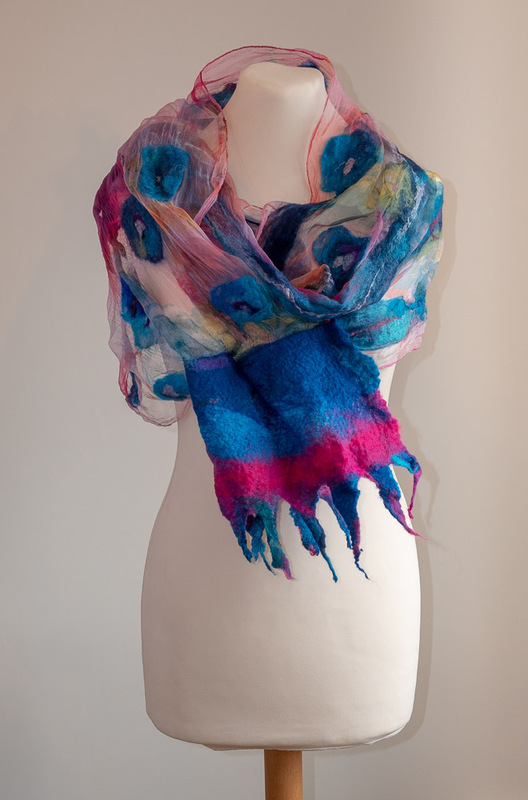 There’s also the beautiful Nuno felted scarf which allows you to create really stunning and unusual designs. You can even decide what sort to make on the day if you aren’t quite sure which one you prefer. The word ‘Nuno’ is Japanese for cloth. It is a wet felting technique that merges loose woollen fibres with a sheer fabric such as silk gauze. When felted the wool shrinks during the felting process it leaves a beautifully subtle texture on the silk, unlike any other technique. 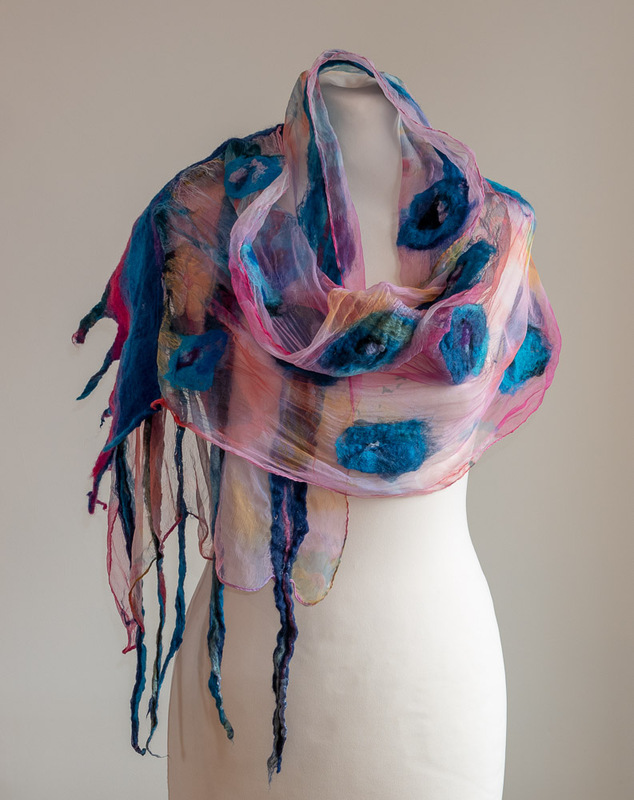 This texture and drape lends itself to the beautiful movement required in a scarf. While the warm woolly scarf does not require a base layer, it still allows for beautiful designs using different coloured woollen fibres. 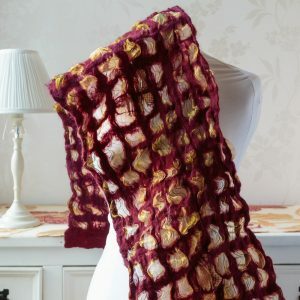 You can make either one of these scarves in a day with expert tuition from Barbara at Feltworld Creative Art Courses. Gift vouchers are available £30 -£65 or £130 if you are looking for a unique and practical Christmas gift. I love how versatile lambs wool fibres can be. 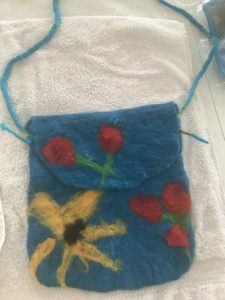 As well as making wearable things such as scarves, slippers and bags you can use it to make beautiful pictures, as several students on my Felted Landscape did recently. Each student chose a landscape picture to use as a basis for their design. Then I taught them how to lay down the colourful fibres to create a picture based on their chosen scene. The beautiful soft lambswool fibres when seen under a microscope have tiny hooks along each hair. When wet, soaped and agitated these interlock to form a fabric that is surprisingly strong. The wool comes dyed in a variety of colours but I also dye my own. With artists paint you can mix your pallet to create new colours, and you can also do this with dyed wool fibres. I show students how to create their own blends to use in their completed piece, or they blend as they create their painting. The fibres are carefully laid out to represent the landscape. 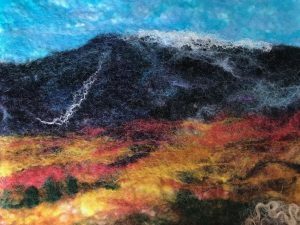 It’s fun seeing how each felted landscape develops with no two being the same. The loosely laid out fibres then have to be felted together to blends the tiny hooks I mentioned. Once this part is complete, your felt picture is rinsed to wash the soap out and dried ready for detail to be added. 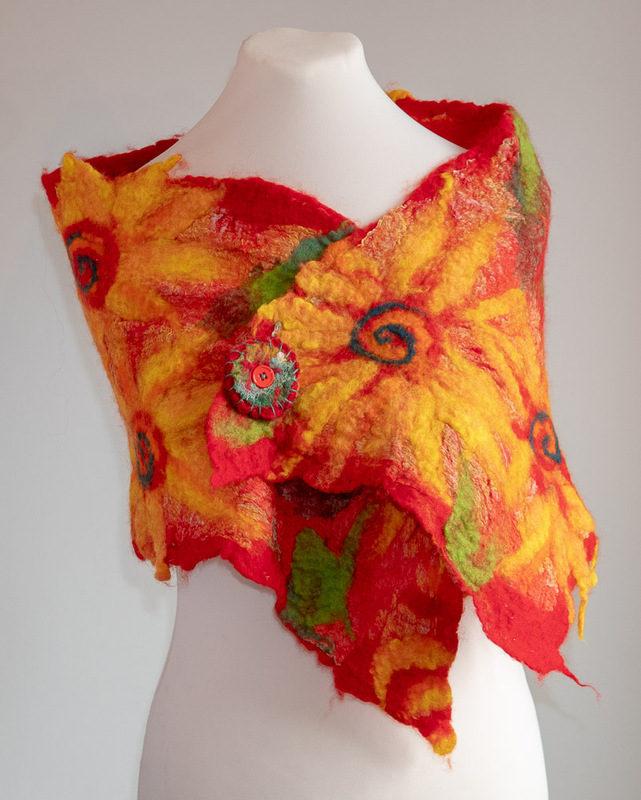 Detailed embellishment can be added in the form or stitch or by incorporating additional wool or silk with the needle felting technique. Special needles are used to hook additional fibres in to your masterpiece. 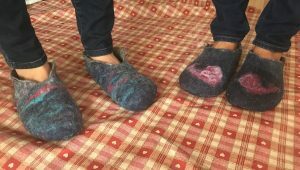 Once completed, the finished piece of felt is very strong so that durable items such as slippers and upholstered footstools are made from the woolly fibres. I cover this in some of my other courses. You can see a two short videos of this on my website home page which will be easier to visualise. I have taught children from 4 years up to 95 years – it is not a hard process to pick up. 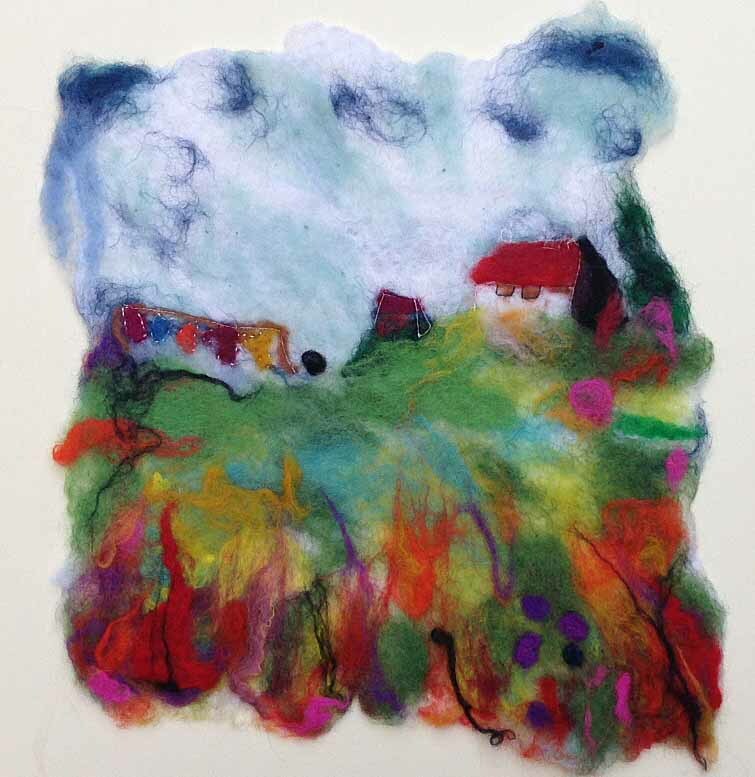 The students in this weekend class all had a great time and left with some beautiful felted landscapes. All materials and a lovely lunch are included to make your day a pleasant creative experience. We typically think of textiles as the woven cloth used for clothes and soft furnishings. But it wasn’t always that way. Wool has been used in creative ways for thousands of years. Felt, made out of wool fibre, is thought to be the oldest known textile. For many people, especially those in nomadic groups, it is still a useful material used to make clothing, rugs, and even tents. For others of a certain age, felt brings back childhood memories of Fuzzy-Felt pictures made out of those colourful pre-cut felt shapes. Sadly, computer games are more popular with today’s kids. 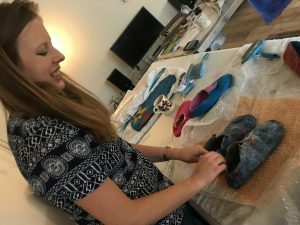 Fortunately, you don’t have to be a nomad or of any particular age to join in the resurgence of felt-making as a very colourful medium for both practical and artistic use. 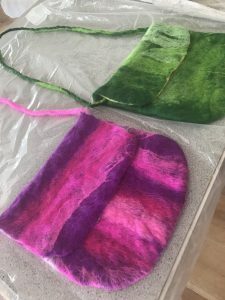 The group of ladies who joined me for one of my two-day Creative Felt Weekend courses were able to discover just how versatile and colourful felt-making can be. 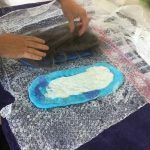 The Creative Felt Weekends cater for both beginners, and for felt-makers who want to learn how to make more ambitious felt pieces. And the choice of things you can make is extensive. I hired a beautiful converted barn with so much character in a beautiful setting close to Penkridge for the weekend. A couple of ladies stayed in the accommodation there and Janis had travelled all the way from the USA to attend. I ran the course from there, what a treat. 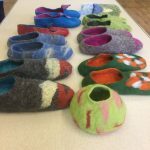 Six ladies attended, many of them were first time felters and jumped in at the deep end and the more advanced level where they made slippers and handbags. I’m happy to say that there were all amazed at what they achieved in such a short time and all of their creations were fabulous. Many of these items are also taught on my one-day courses. 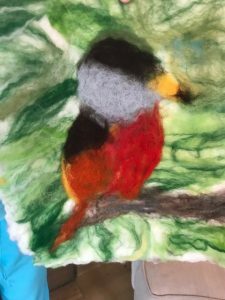 For details of the next Creative Felt Weekend and all the other courses I offer, please visit the Courses page where you’ll see many more examples of what can be made from felted wool. Felted wool lends itself to all sorts of uses, an upholstered footstool for example. 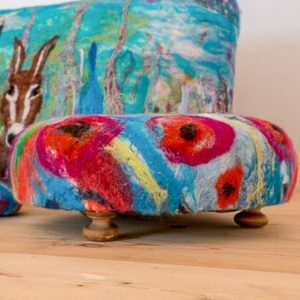 Did you know you can make upholstered footstools out of felt? 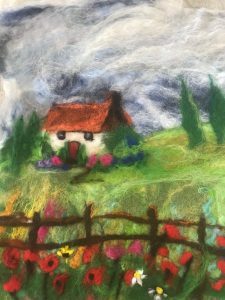 OK, so not entirely out of felt – there’s a wooden frame and some foam upholstery padding as well (which I supply on my courses) – but the star of the show is the piece of feltwork that you create in my class. Felting dates back many years and relies on the natural property of wool to bing with itself when worked in a special way. The resulting cloth is very durable. Feltworld Creative Art courses are an ideal way to learn a new skill. You can arrive knowing nothing about felting. At the end of the day take home something that is beautiful as well as useful around the home! If you’d like to see more examples and book a place for yourself or a friend then click here or on the photo to go to the Footstool Courses page. Nuno felting is such an amazing technique that will surprise and delight you at the same time. It is becoming increasingly popular as people want to learn fun creative crafts and art forms. By incorporating a silk, fine polyester or cotton with 100% wool fibres, you can achieve the most beautiful textures that will attract many a comment and admiration. 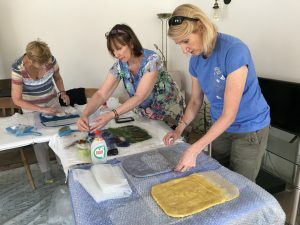 If you would like to learn more about this technique and come a long to one of my courses, then please take a look at my Feltworld.co.uk courses page for dates and information. or maybe pop your name on to my Newsletter. 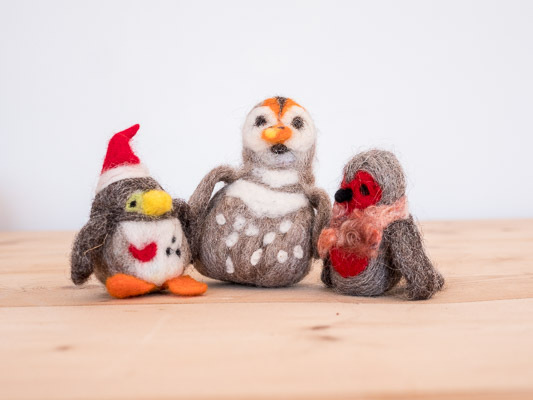 You’ll be surprised at what you can make using felted wool! I love to teach this class and am really looking forward to teaching it again. My workshops are usually very flexible as I prefer to have people making what they would like to make. I would much rather you make something that you want to use or give as a present. Just ask me any question and I will endevour to get back to you pronto! 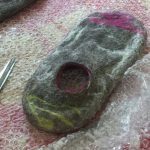 We will use the wet felting method to make slippers to fit the shape of you’re own feet. I am always surprised at the very different shapes and sizes that are put in front of me lol. No seriously, you will make slippers custom made to the shape and size of your feet I promise you. We will use a custom made template/relief and set to work with my beautiful array of different coloured fibres. We then layer wool to the required thickness before wetting with soap and water. This causes the fibres to felt together when agitated.